On 2 November 1914 McNeile travelled to France as part of the British Expeditionary Force: he was a regular soldier, who had been in the Royal Engineers since 1907. He saw action at the First and Second Battles of Ypres (where he was gassed) and the Battle of the Somme. In 1916, he was awarded the Military Cross and was mentioned in dispatches. He was promoted to major, and then, in April 1918, he was promoted to acting lieutenant-colonel, and commanded a battalion of the Middlesex Regiment. His battalion fought during the Hundred Days Offensive in the St. Quentin-Cambrai sector in September 1918. On 2 October 1918 he broke his ankle; he was still convalescing at the end of the war. He spent 32 months in France (in a war which had lasted 50 months). Bulldog Drummond started his career as an adventurer because he was bored; McNeile gave the same reason for starting writing. During the War McNeile wrote more than 80 stories about life on the Western Front. His first story, “Reminiscences of Sergeant Michael Cassidy”, was serialised in the Daily Mail from 13 January 1915. Serving officers were not permitted to publish under their own names, so Lord Northcliffe of the Daily Mail gave McNeile the pen name “Sapper”, after the common nickname of the Royal Engineers. 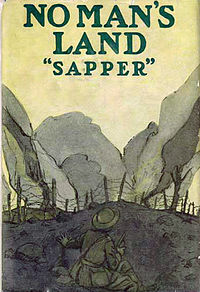 Sapper had written enough stories before the end of 1915 to have two collections of them published by Hodder and Stoughton: The Lieutenant and Others and Sergeant Michael Cassidy, R.E. The books sold extremely well, and by the end of the war he had published three more collections, including No Man’s Land (1917). In 1916 Hodder and Stoughton also published as a book a series of articles that he published in The Times in June 1916, called The Making of an Officer.